Curious about how to paint furniture white? Is there a secret to painting white furniture? 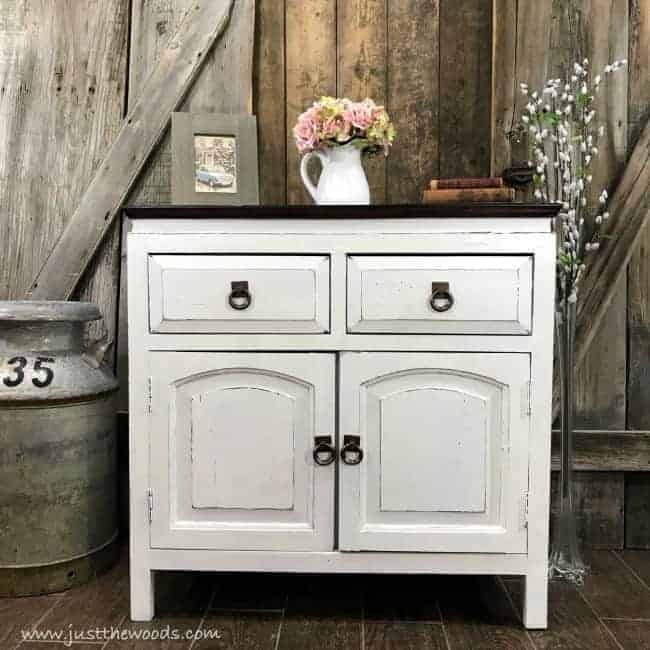 This cabinet is given a white painted furniture makeover. 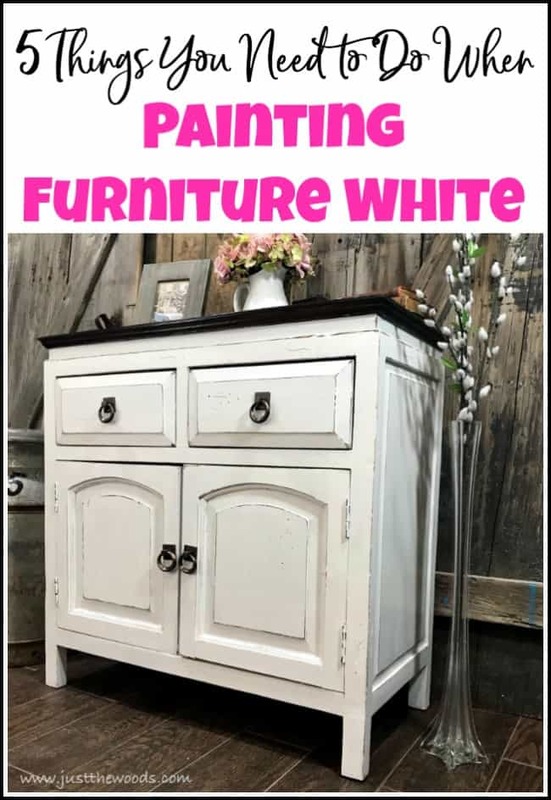 Follow these 5 tips to painting furniture white for a result you will love. 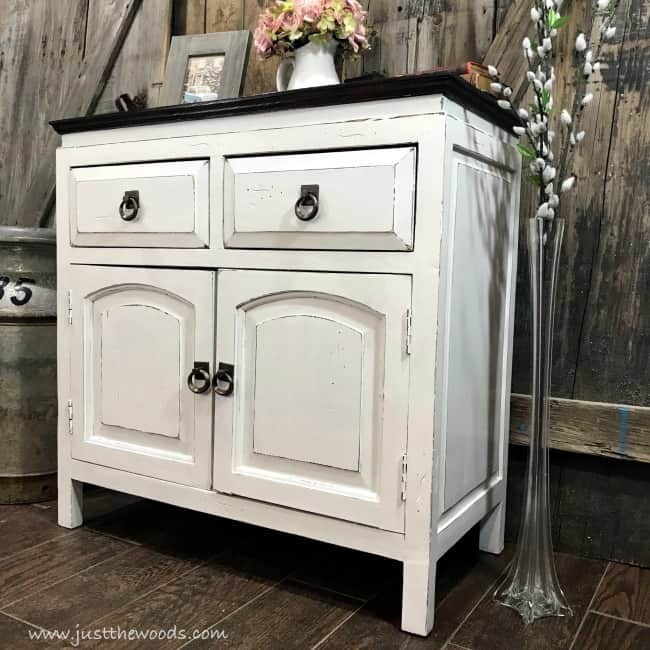 Do you ever wonder how to paint furniture white? Is there a secret to painting white furniture? 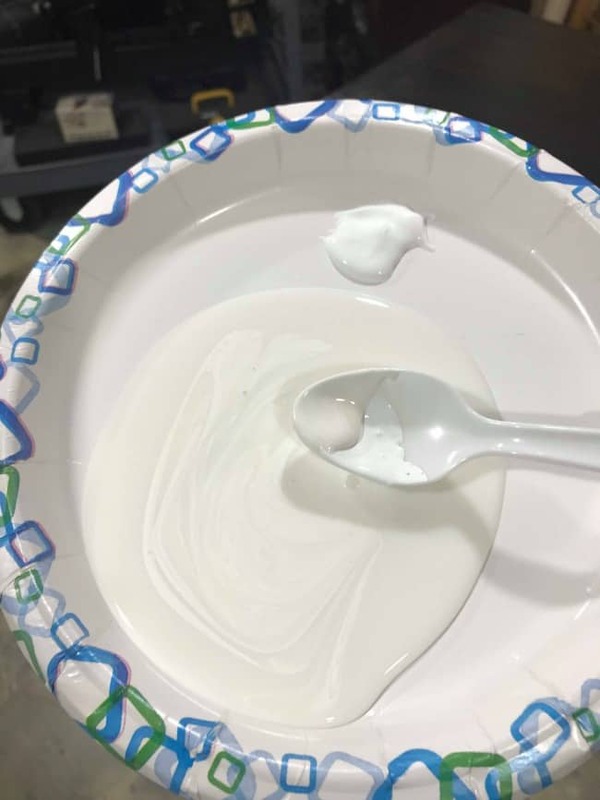 Maybe there is a secret white furniture paint that is like the holy grail to furniture painting? Nope, there isn’t. I wish there were. The truth is- I don’t think there is one best paint for painting furniture whether white or any other color. Of course, there is furniture paint and then there is wall paint. There is quality paint for furniture and lower quality paint. At the end of the day, most people find what they are comfortable with using and stick with it. But let’s stay focused on the end game here, which is painting furniture white. 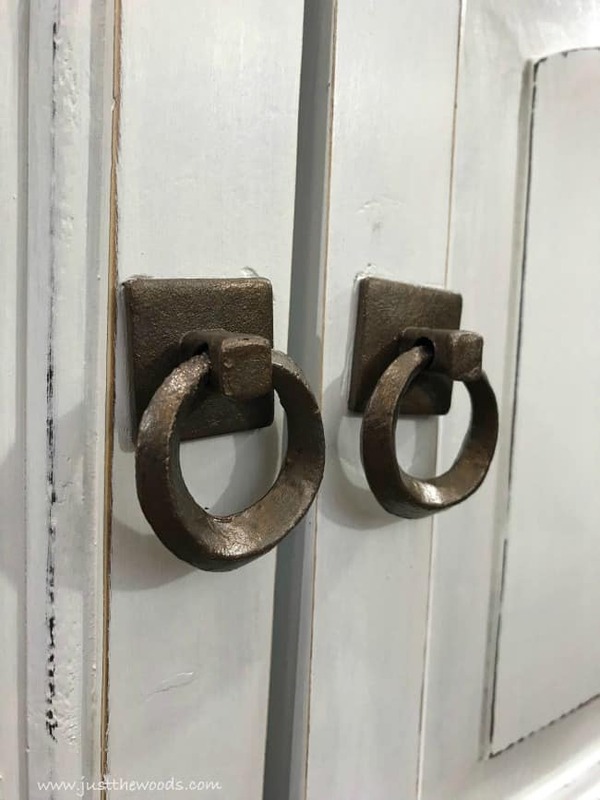 So, when you plan to paint wood furniture white you really need to make sure that you take a few necessary steps to ensure a quality end result that you will be happy with. Disclosure: This post contains affiliate links for your convenience. I may be compensated if you make a purchase after clicking on my links. Click here for my full disclosure policy. 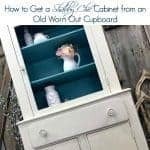 This plain wooden cabinet is up for a makeover. The owner scooped it up for only $20! She asked that it be given a makeover just like the one I did for her over 3 years ago. She loves color but likes to keep her painted furniture neutral so it will remain timeless as her decor may change. Smart lady! This is the piece that was made over 3 years ago: Timeless White Painted buffet This is the piece that we are about to give a furniture makeover. 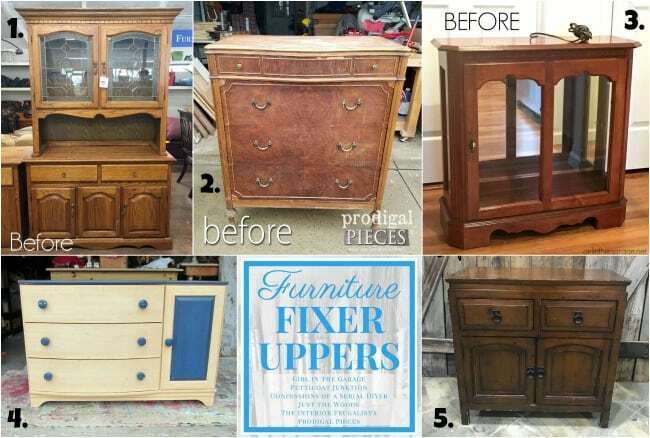 Make sure to stick around all the way to the end, its Furniture Fixer Upper time where my fellow furniture painting friends join in and share their projects as well. The first step when painting furniture white, or painting furniture any color for that matter is the prep. Prep is probably the most important step in furniture painting. 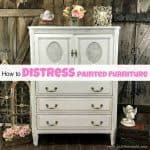 This is my go-to process for How to Prep Painted Furniture. In addition to the standard prep process this cabinet is getting a new stain top, so the wood must be sanded down using my favorite orbital sander. Now that your piece of furniture is cleaned, sanded and prepped I always like to use a primer before painting furniture white. 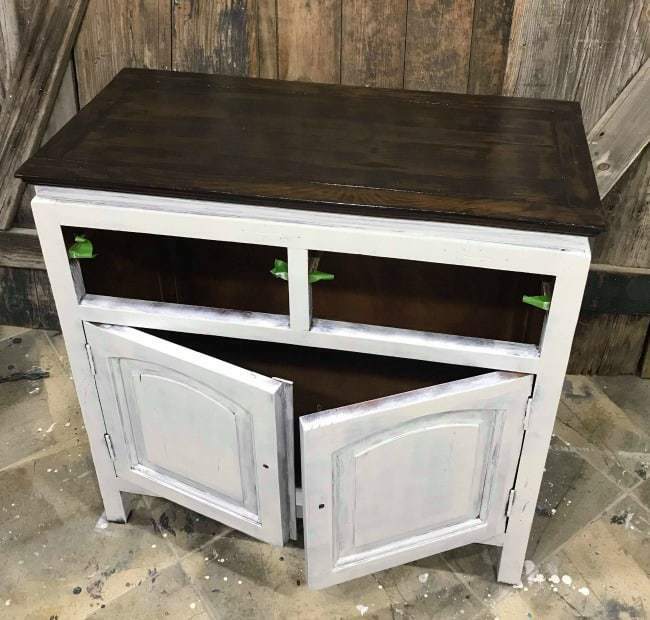 You can find other painted furniture projects that required primer here: primer. I admit that I didn’t use to use primer at all since most chalk paints claim that it isn’t necessary. But over time, I’ve realized that I prefer to err on the side of caution, especially when using white furniture paint. I prefer to seal in any possible bleed through as well as create a nice foundation before painting wood furniture white. The primer that I use and trust is a shellac based primer and you can find it HERE. 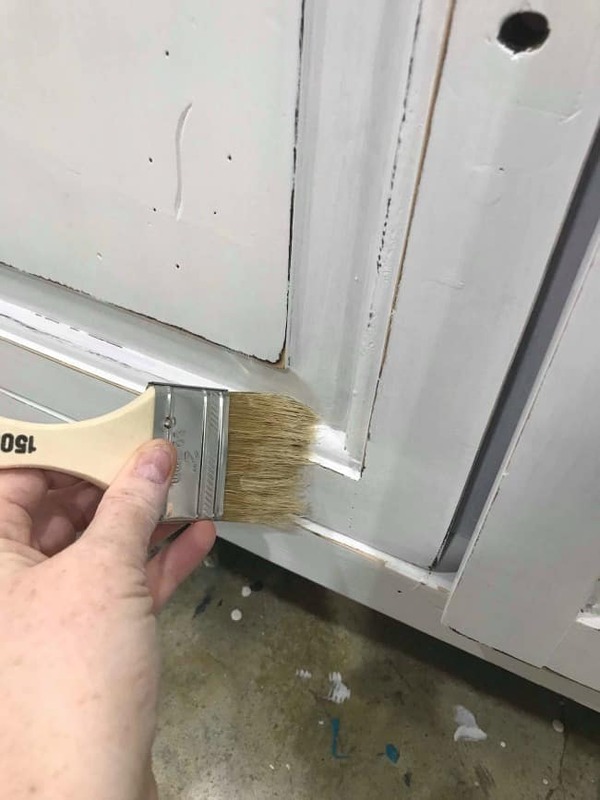 When applying primer to furniture I tend to find that a simple foam roller works best for the flat areas, and a chip brush works great for getting into the details, or crevices. Here is the cabinet with two coats of white primer. 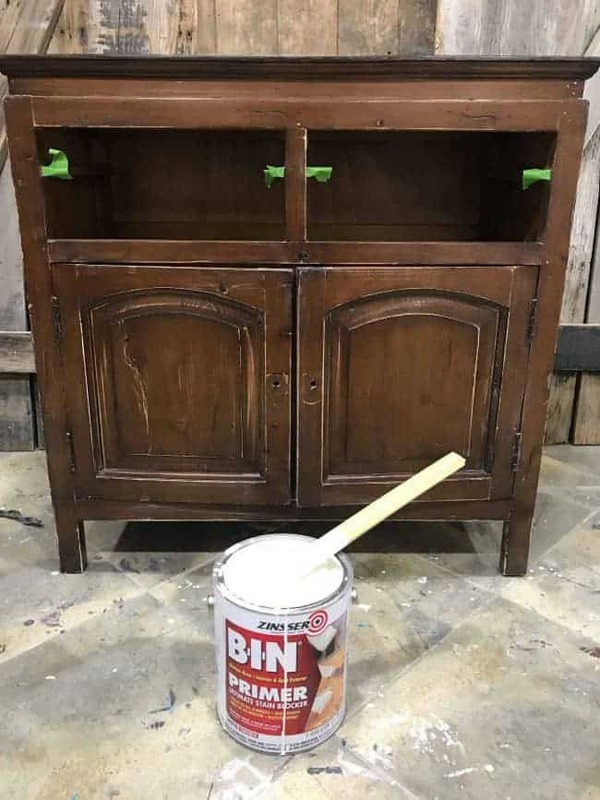 If you are new to painting furniture you can always start at the beginning with How to Paint Furniture – a Beginners Guide. 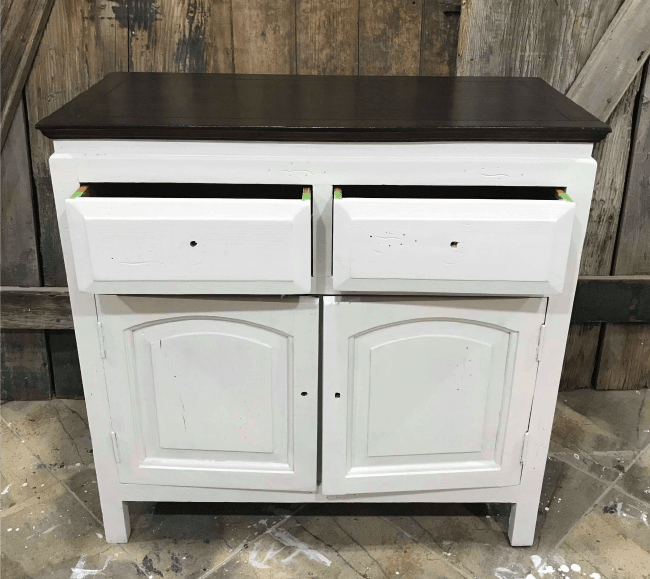 You may be unsure as to which white furniture paint to use for your painted furniture project. There are so many different types and brands of paint out there. For this project, I’m creating a custom mixed white paint using both an off-white, and a stark pure white. You can get great furniture paint online HERE. When you paint furniture white, even with a primer you will still need a minimum of two coats of white paint. There is less pigment in white furniture paint making it sometimes seem as if it’s see through. Don’t get discouraged, with primer and two coats of paint your piece will start to look beautiful. This is with two coats of the custom mixed white furniture paint on the cabinet. Step four is actually a step that you should do throughout the entire process. In between each coat of primer, and paint you should lightly sand your piece of furniture. 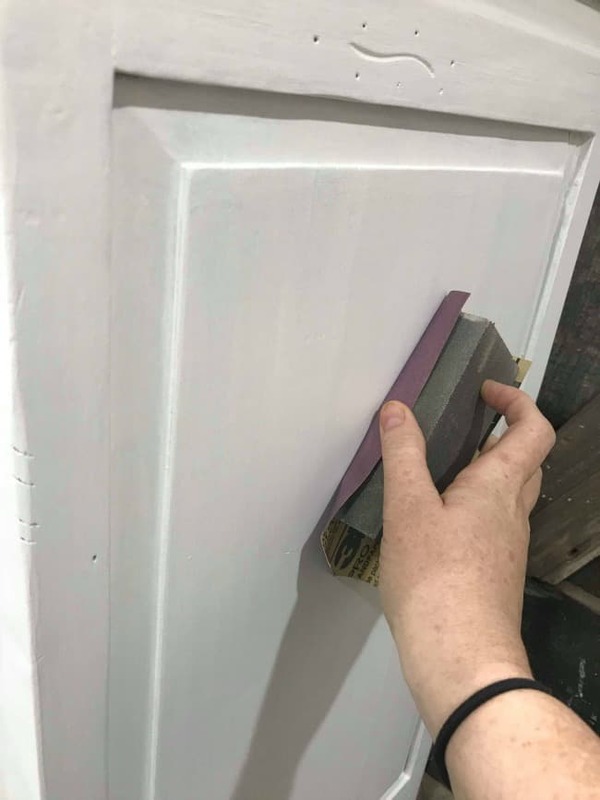 By sanding between coats, you are maintaining a smooth soft finish and you also get the opportunity to see if you missed a spot anywhere along the way. You don’t have to go crazy, a quick once over with a 320 grit is fine. After you give a quick sanding, always make sure to go back and remove the dust that you just created. 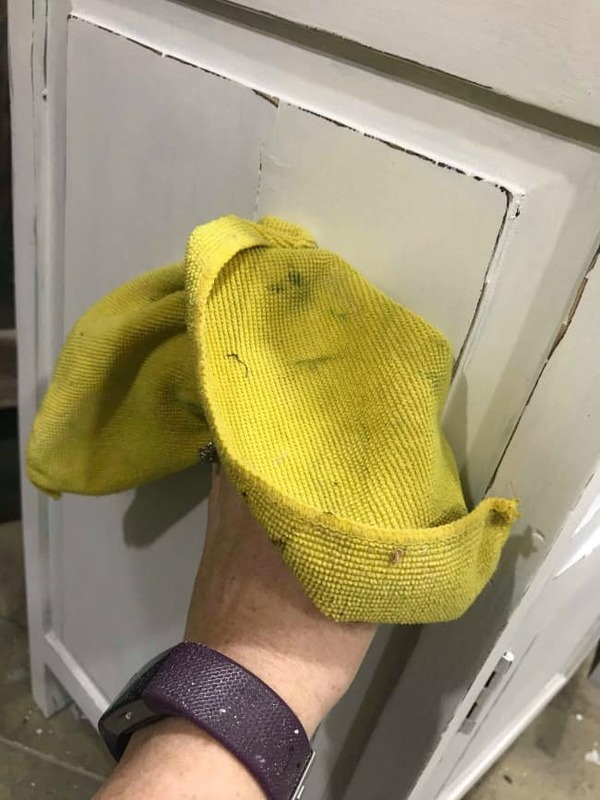 A clean lint-free cloth to wipe away the dust works perfectly. You can find them online HERE. 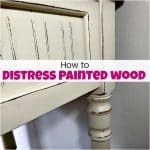 This applies to every time you sand your piece of furniture, both sanding between coats and distressing. Lastly, before sealing your piece go ahead and use an old hairdryer to blow away any sanding dust that may fall into the corners or crevices. You don’t want to seal your dust onto the piece. 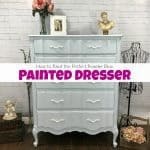 Now you should have your piece of painted furniture all cleaned, prepped, primed, painted, sanded and ready for sealer. 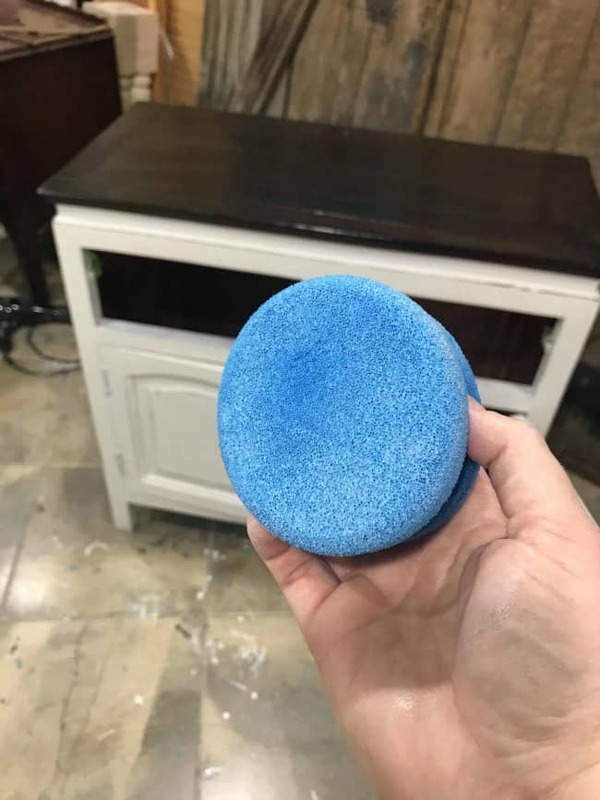 One major issue that many furniture painters seem to have is that when they are painting furniture white is that they worry about their clear sealer turning yellow. No one wants a yellow tinge over their white painted furniture. 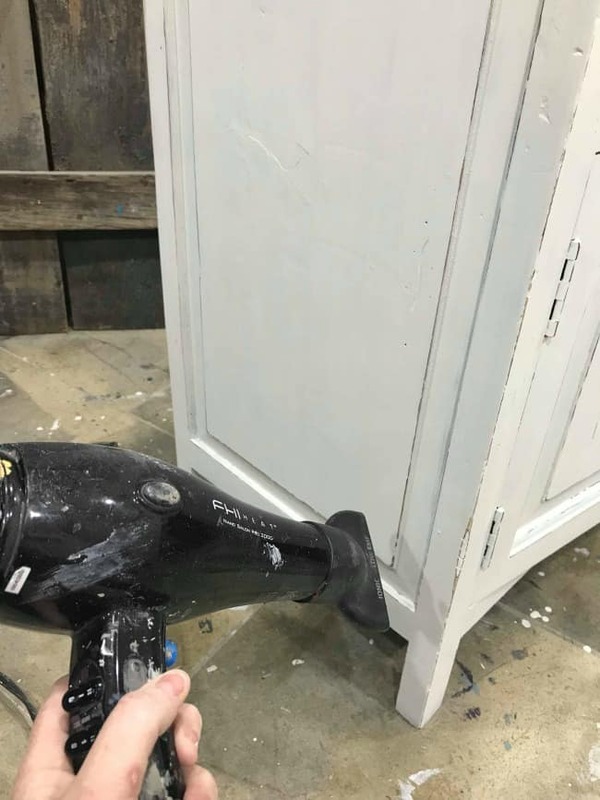 This is my little secret that I like to do when sealing a white painted piece of furniture. First, I grab my clear sealer. Then squirt your clear sealer onto a plate and then I dab a little bit of my white furniture paint in with my clear sealer. Just enough to give the sealer a white tint. You don’t want to add a lot of the white paint, just a little. To make sure that your sealer doesn’t pool up in the corners or crevices, go back with a chip brush and remove any excess sealer. 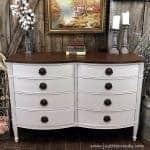 When you are finished you should have a white painted makeover that you love! 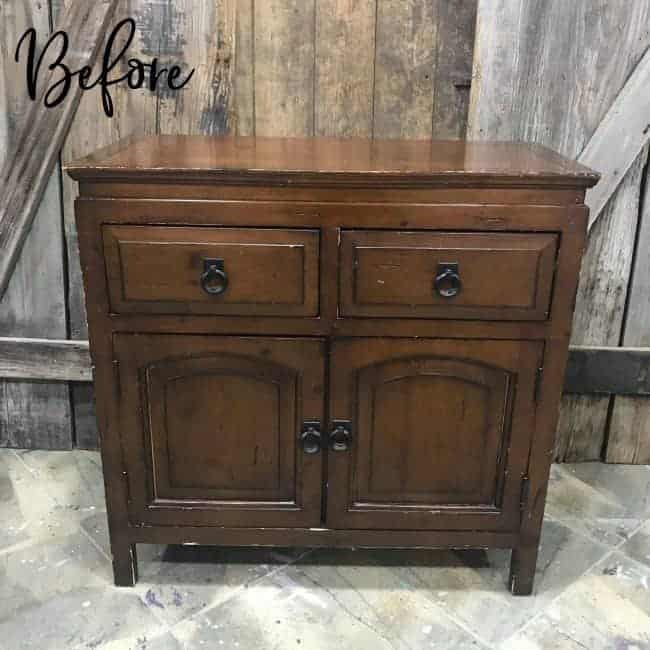 A few of my creative and talented blogger friends and I have joined together in our monthly Furniture Fixer Uppers share. Let’s see what my friends are up to! Make sure to click the links below the image to check out all the amazing projects that my bloggy girls are working on this month. Nothing more refreshing that a beautiful coat of paint to bring new life back to a piece. This is beautiful, Kandice! Very nice and I appreciate your instructions being so informative, You did not mention how you refinished the top. If you’ve presented this method before, would you please reference it? It looks so good I’d like to know what stain you used. Thanks. Oh this piece looks a million times better in white! Great tips Kandice! What type of sealer is that, so I can look for something equivalent available in Canada? Love it!! It has that nice country charm now! I love how you kept the top a darker tone, it gives it more character that way! Great job! It turned into a beautiful useful piece. Excellent detailed tutorial, Kandice – pinned! I’ve never applied a protective coat with sponges and you have me intrigued. The cabinet looks lovely and I bet your client was thrilled with the results. Hi, I hope you can help. I sanded and old desk down, sealed with one coat of the BIN sealer, applied 2 coats of chalk paint (rustoleum) in white, applied one coat of polycrylic and it is bleeding through in spots an orangish color and has some bleed through on top, what can I do? Really helpful article for a beginner, special thanks for the video! Hi there! 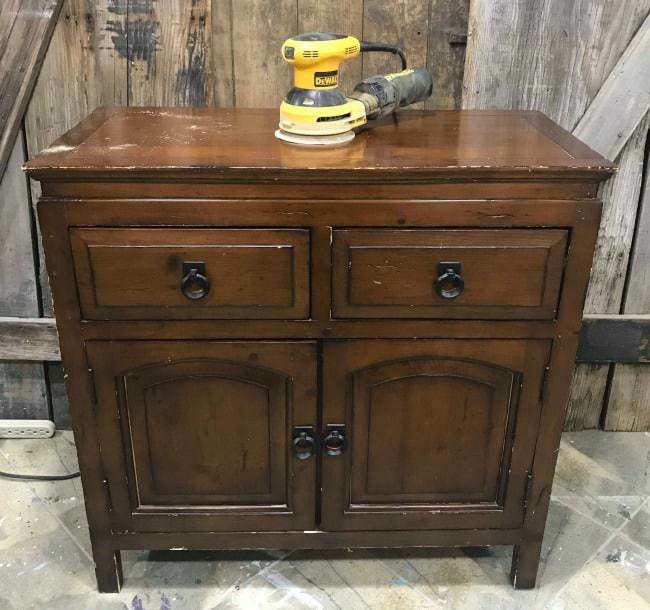 I am a hobby furniture refinisher/repurposer, but I’m now being hired to do a few pieces for an actual client, and want to be sure I do it right. So, I really appreciate this information, but I also have a few questions (my apologies in advance if you’ve already answered these somewhere and I missed or glazed over it): What grit of sandpaper (discs) do you use with the orbital sander? What is the best way to tape off mirrors? I see you recommended the Dixie Bell paint, but it is really expensive – is there any alternative, more affordable brand you can recommend? I will be working with light wooden pieces that might need to go black…paint, stain, other? Btw, the orbital sander link on that list goes to primer 😶. Anyway, thanks so much! As far as paint, I feel, especially when painting for clients that I dont want to cut corners with quality paint and most of the quality paints out there are in the same price range.